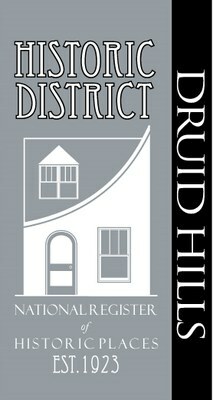 History – Druid Hills was platted in 1923 and exemplifies the “Olmstedian” concept of land planning, consisting of a number of curvilinear streets with mature trees and open spaces. Architectural styles in the neighborhood include multiple Craftsman Bungalow, Tudor Revival, and Colonial Revival along with less common styles. There are seventy-six contributing houses/outbuildings.